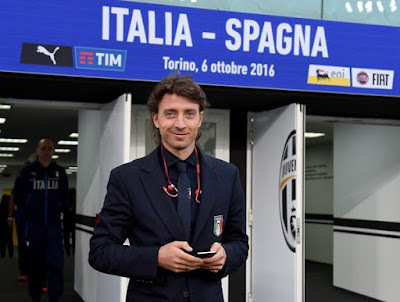 Montolivo has now had successful surgery on his knee to repair ligament damage that occurred in the Italy vs. Spain match on Thursday. He has six months of healing and recovery ahead of him, something no one should be envious of. However, that six months ironically gives everyone else a chance to heal, too. Either fans will find someone else to hate, or maybe they will be able to view his performances more judiciously when he gets back. I don’t know anyone who wishes harm or injury on anyone, but now that it’s happened, perhaps we can all find a little healing. The injury itself was strange. Ramos barreled into Montolivo and the ref called Montolivo for the foul. That seemed harsh enough, but the way Montolivo grabbed his knee in pain, it looked absolutely terrible. It’s a horrible injury for anyone to have, and the recovery is not only long, but painful. However, some people apparently did wish him ill, as he addressed in a statement yesterday: “And a caress to all those who wished me a broken tibia and fibula, the rupture of all my ligaments and death, with the hope that life is able to make you grow in terms of education and respect for other human beings.” Ouch. Hopefully six months of healing will help the fans. I know that six months will help me heal. I’ve made it no secret that I’m no Montolivo fan. I actually never wanted him to come to Milan, and his being handed the armband ahead of the rightful players made me dislike him instantly. His inexplicable inclusion in every starting lineup no matter how poorly he played the week before will no longer make me crazy. I won’t miss him walking around the pitch, losing balls, allowing goals, whining to the ref incessantly, and more. Six months of seeing anyone else given a chance at that spot, even if they are worse, will mean fewer broken things around here during games. But more importantly, it means we now will finally get to see who else we have at that spot. 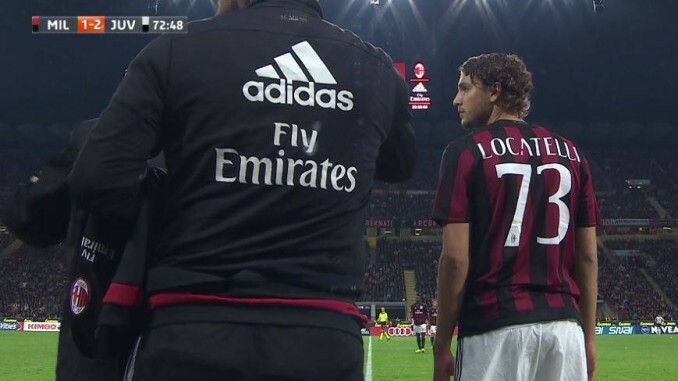 The fan favorite is Locatelli, a player whose Serie A debut was delayed because Montolivo refused to be subbed off last year. Ironically, Montolivo finally was subbed off against Sassuolo for Locatelli, who rose to the occasion, played brilliantly, and scored a great goal. If he truly is as talented as everyone says he is, he will be a massive upgrade in age alone, going from the 31 year-old Montolivo to the 18 year-old Locatelli. And ironically, Locatelli got his first U21 callup for Italy because he replace the player who was called up to replace Montolivo. That is some incredible Karma. We have other players who can play at that position as well, and the timing couldn’t be more perfect. We have two months to sort out whether any of them can make the grade or not. If not, the transfer window and that €100m awaits our shopping pleasure. If the new management and owners want to change things and impress right away, they can purchase a world class player at the central defensive midfielder spot, the one thing Galliani never did after pushing Pirlo out. Does healing get any better than that? When Montolivo returns, he should face some stiff competition for his spot, one way or the other. I like to believe that the new management will never cater to his every whim like this current management have. That finally, after all of these years, he will have to fight for his spot and prove himself like every other player. That he cannot run to the President to earn his spot back when benched. And maybe, just maybe, the armband will not automatically be given to him. But whatever happens, six months of healing is necessary for him, and potentially a blessing for us. Get well, Montolivo.